On Thursday, the 8th. of September, 1887, in the early hours of the morning, when the star Bharani was in the ascendant was born a boy-child in the village of Pattamadai on the bank of the river Tamraparani in South India. Sri P.S. Vengu Iyer, a revenue officer and a great Siva Bhakta (devotee of Lord Siva), and Srimati Parvati Ammal, an equally great god-fearing lady, were the fortunate parents of this child. The happy couple christened this last and third son of theirs Kuppuswamy. Boy Kuppuswamy was intelligent and mischievous. In his boyhood itself he showed signs of Tyaga (renunciation) and love for fellow-beings. He used to pity the poor, feed the hungry at the door, and make his father throw a pie into the hands of pauper passing by. He often got cakes and sweetmeats from his mother and distributed them liberally to his younger companions, dogs, cats, crows, and sparrows, himself not eating a bit. He used to bring flowers and bael leaves for his father's Siva Puja. At the Rajah's High School, Ettayapuram, where he studied, Kuppuswamy always topped the class and won prizes every year. He had a sweet voice and wonderful memory. When His Excellency Lord Ampthil, the Governor of Madras, visited the Kuru Malai Hills in 1901 for hunting, Kuppuswamy sang a song of welcome on the Kumarapuram railway platform. After the completion of the Matriculation examination, he studied at the S.P.G. College, Tiruchirapalli. In the college he used to take part in debates and dramas. He played the part of Helena beautifully when Shakespeare's "Midsummer Night's Dream" was staged in 1905. After the completion of the First Arts Examination, Kuppuswamy went to the Medical School in Tanjore to study medicine. He used to be tremendously industrious and never went home during the holidays. He would spend the entire period in the hospital. He had free admission into the operation theater. Kuppuswamy was first in all subjects. He possessed more knowledge than doctors with covetable degrees, and in the first year itself he could answer the papers which the final year students could not. Kuppuswamy completed the course and earned the title of M.B.,C.M. He practiced at Tiruchi. While practicing, he started a medical journal called "The Ambrosia". He got one hundred rupees from his mother for the initial expenses of running the journal. Later, when his mother wanted a hundred and fifty rupees for celebrating some festival, Dr. Kuppuswamy had the money ready for her. Even then he used to distribute the journal freely; he was very shy to ask people for contribution. A call came to Dr. Kuppuswamy from Malaya, soon after the death of his father. He used to have an adventurous spirit in him. In 1913 he left India in the "S.S. Tara". Kuppuswamy belonged to an orthodox Brahmin family and was afraid to take non-vegetarian food in the ship. So he carried with him a good quantity of sweets which his mother had prepared for him. When he arrived in Singapore, he was almost half dead! Dr. Kuppuswamy describes his experiences in Malaya: "Immediately after disembarking, I went to the residence of Dr. Iyengar. He gave me a letter of introduction to his friend, Dr. Harold Parsons, a medical practitioner in Seremban. When I arrived there, Dr. Parsons introduced me to Mr. A.G. Robins, the manager of a nearby rubber estate which had its own hospital. Fortunately for me, Mr. Robins was just in need of an assistant to work in the Estate Hospital. He was a terrible man with a violent temper, a giant figure, tall and stout. He asked me, 'Can you manage a hospital all by yourself?' I replied 'Yes, I can manage even three hospitals'. I was appointed at once. I had been told by a local Indian resident that I ought not to accept, in accordance with their policy, anything less than a hundred dollars a month. Mr. Robins agreed to give me one hundred and fifty to start with". Dr. Kuppuswamy was very kind, sympathetic, humorous, witty, and sweet-speaking. Hopeless cases came to him, but success was sure. Everywhere people declared that he had a special gift from God for the miraculous cures effected in the patients and acclaimed him as a very kind and sympathetic doctor with a charming and majestic personality. In serious cases, he kept vigil all night. In his private practice, Dr. Kuppuswamy used to attend to the poor and often not charge them even visiting or consulting fees. Instead he would give them money for special diet or to cover their own expenses after discharge from hospital. He gave money like water. Once a poor man, drenched to the skin, came to the doctor at night. His wife was in birth pangs. The doctor went there at once to her aid, and after attending to her, stayed outside the hut in spite of the heavy rain. Only after the save delivery of the child did the doctor return home the next morning. In spite of his busy life, Dr. Kuppuswamy served the Sadhus, Sannyasins, and beggars. He attended marriage functions, parties, and other social gatherings. Once a Sadhu gave him a book "Jiva Brahma Aikyam" by Sri Swami Satchidananda. It ignited the dormant spirituality in him. He began to study the books of Swami Rama Tirtha, Swami Vivekananda, Sankara, Imitation of Christ, the Bible, and literature of the Theosophical Society. He was very regular in his daily worship, prayer and Yoga Asanas. Study of sacred scriptures like the Gita, the Mahabharata, the Bhagavata, and the Ramayana was done with great devotion. Sometimes he conducted Nandan Charitam and sang Bhajans and Kirtans. He practiced Anahat Laya Yoga and Swara Sadhana. High-class dress, and collection of curious and fancy articles of gold, silver, and sandalwood always attracted the doctor. Sometimes he purchased various kinds of gold rings and necklaces and wore them all at the same time. He used to wear ten rings on ten fingers! When he entered shops, he never wasted his time in selection, haggling, and bargaining. He gathered all that he saw. He paid the shopkeepers' bills without scrutiny. Nothing could tempt the doctor. His heart was as pure as the Himalayan snow. His immense philanthropy and spirit of service and renunciation endeared him to all. People lovingly called him the "Heart of Love". As days passed, he reflected more and more and wanted to renounce the world. His heart was purified through loving service. At last, Dr. Kuppuswamy, enjoying a lucrative practice, renounced the world like Prince Siddartha, in 1923. He left Malaya for India. At Madras he proceeded to the house of a friend and left his luggage there. He began his pilgrimage. At Benares, he had the Darshan (vision) of Lord Visvanath. He visited Mahatmas (great souls) and temples. At Dhalaj, a village on the bank of the Chandrabaga river, he met a postmaster and lived with him. He acted as the postmaster's cook, and when the latter arrived home in the evening, the doctor was ready to shampoo his legs in spite of his remonstrances! It was the postmaster who suggested Rishikesh when the aspiring doctor wanted a place for solitary meditation. Dr. Kuppuswamy reached Rishikesh on the 8th of May, 1924. On the 1st of June, 1924, there came His Holiness Sri Swami Visvananda Saraswati. The doctor saw a Guru in the monk and the monk saw a Chela (disciple) in the doctor. After a brief exchange of words, Dr. Kuppuswamy was initiated into the Sannyas order by Swami Visvananda. Swami Vishnudevanandaji Maharaj, the Mahant of Sri Kailas Ashram, performed the Viraja Homa ceremonies. The Guru named the doctor Swami Sivananda Saraswati. Swami Visvananda wrote the necessary instructions about Sannyas Dharma from Benares. Swami Sivanandaji stayed at Swargashram for Sadhana. Swami Sivananda dressed to clothe himself, ate to live, and lived to serve humanity. A small dilapidated Kutir (hut), not resorted to by others and infested with scorpions, protected him from rain and sun. Living in that Kutir, he did intense Tapas (austerities), observed silence, and fasted. Often he fasted for days on end. He would keep a good stock of bread in his room, and for a week have this, together with Ganges water. He would stand up to the hips in the ice-cold Ganges in winter mornings and commence his Japa, coming out only when the sun appeared. He would spend more than twelve hours in daily meditation. With all his intense Tapas, Swamiji did not neglect service of the sick. He visited the huts of the Sadhus with medicines, served them, and shampooed their legs. He begged food on their behalf and fed them with his own hands when they fell sick. He brought water from the Ganges and washed their Kutirs. He attended upon cholera and small-pox cases. If necessary, he kept vigil through the night by the side of the bed of the ailing Sadhu. He carried sick persons on his back to the hospital. With some money from his insurance policy that had matured, Swamiji started a charitable dispensary at Lakshmanjula in 1927. He served the pilgrims and saw Narayana in them. Swamiji practiced all the various Yogas and studied the scriptures. After years of intense and unbroken Sadhana, he enjoyed the bliss of Nirvikalpa Samadhi. He had come to the end of his spiritual journey. He used to gather bits of paper and used envelopes, and stitch them into little notebooks. He entered some self-instructions in them. Some of the instructions found in them read thus: "Give up salt, give up sugar, give up spices, give up vegetables, give up chutnies, give up tamarind". In another we read: Serve Bhangis, serve rogues, serve inferiors, remove faecal matter, clean clothes of Sadhus - take delight, carry water". In another page: "Do not revenge, resist not evil, return good for evil, bear insult and injury". On some neat little pages we again read: "Forget like a child any injury done by somebody immediately. Never keep it in the heart. It kindles hatred. Cultivate Maitri (friendship), Karuna (compassion), Daya (mercy), Prema (love), Kshama (forgiveness)". In another paragraph we see: "Develop good manners, extreme politeness, courtesy, etiquette, good demeanour, nobility, gentleness, mildness. Never be rude, harsh, or cruel. There is nothing to be hated in the world. Hatred is ignorance. All contempt for anything or being must be removed through love and Vichara (enquiry)". Swamiji traveled the whole length and breadth of India during his Parivrajaka (wandering monk) life. He visited important places of pilgrimage in the South, including Rameswaram. He conducted Sankirtan and delivered lectures. He visited Aurobindo Ashram and met Maharishi Suddhananda Bharati. At Ramana Ashram, he had Darshan of Sri Ramana Maharishi on the Maharishi's birthday. He sang Bhajans and danced in ecstasy with the Bhaktas of Ramana. Swamiji went on a trip to Kailas-Manasarovar and Badri. He returned after the pilgrimage, to Rishikesh, and in the year 1936 sowed the seed of The Divine Life Society on the bank of the holy Ganga. He found an old Kutir, dilapidated and disused, which looked like an abandoned cowshed. To him it was more than a palace. It had four 'rooms'. He cleaned the Kutir, and occupied it. Then, the increasing number of disciples who sought his lotus-feet, undaunted by forbidding conditions of living, necessitated expansion. They found more cowsheds, vacant, but uninhabitably filthy. In one room, an old cowherd was living; the others were full of hay and dung. In about a year or so, the old cowherd also vacated his 'room', and the Divine Life army completed the occupation. Thus began the early life of The Divine Life Society. From this small beginning the Society grew imperceptibly and it is now the headquarters of a world-wide Organization having a large number of Branches both within the country and outside. He got the Divine Life Society Registered as a Trust in the year 1936, with the main objects of dissemination of spiritual knowledge and selfless service of humanity. The free distribution of spiritual literature drew a steady flow of disciples of Sri Swamiji. With the getting of able hands, he started the various departments of the Society to provide suitable fields of activity for the purification of their hearts and to grow spiritually. The publication of the monthly journal, 'The Divine Life', was commenced in September 1938, to coincide with the celebration of his birthday. The world was in grip of the 2nd world-war and in order to release a continuous stream of peace-current in the whole world, to help the distressed minds of the people, he started the Akhanda Mahamantra Kirtan (non-stop chanting of the Mahamantra, Hare Rama Hare Rama; Rama Rama Hare Hare; Hare Krishna Hare Krishna; Krishna Krishna Hare Hare, round-the-clock) on the 3rd of December 1943, and also instituted the Lord Sri Visvanath Mandir with three-time regular worship, daily, on the 31st December 1943. Swami Sivananda believed in synthesis in everything, in Yoga as well as in the alleviation of human suffering. The Allopathic treatment was inseparable from him and the Society, even from the earliest days of his life at Swargashram. He now felt the need to serve the people with genuine Ayurvedic preparations out of the rare Himalayan herbs. He therefore instituted the Sivananda Ayurvedic Pharmacy in 1945, which now has grown to such an extent that it is even unable to cope up with the increasing demands from people. Swami Sivananda organized the All-world Religions Federation on the 28th December 1945 and established the All-world Sadhus Federation on 19th February 1947. The year 1947 saw a great expansion in the activities of the Society. It was the year of the Diamond Jubilee of the Great Soul, when a number of buildings sprang up. The Yoga-Vedanta Forest Academy was established in the year 1948 to give a systematic spiritual training to the resident Sadhaks, and also to benefit the visiting seekers. 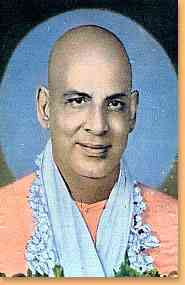 Swami Sivananda undertook a lightning All-India and Ceylon (Sri Lanka) tour in 1950 to deliver his divine message throughout the length and breadth of the country. He virtually awakened the moral and spiritual consciousness in the hearts of the people. The effect was tremendous. Since then there was an incessant flow of seeking souls to the Ashram, as also a greater inflow of letters from aspirants from the entire country, which demanded more intense dissemination of knowledge. The Yoga-Vedanta Forest Academy Press was established in September 1951, a powerful means of wide dissemination of knowledge. Sri Swamiji convened the World Parliament of Religions in 1953, at the Sivanandashram. The small dispensary that was inseparable from Swami Sivananda, grew slowly and became regular Hospital with X-Ray and other facilities. The Sivananda Eye Hospital was formally opened in December 1957. The Hospital has 10 beds for in-patients at present and is being expanded to have 30 beds. The Publication League had published almost all the writings of the Master and a need was felt by his disciples to do research in his works. This gave rise to the establishment of the Sivananda Literature Research Institute in 1958, which, among many things, decided to get the works of the Master translated and published systematically in all the regional languages in India. Thus the S.L.D. Committees was established in 1959 which has Regional Committees for each language. The Society's Silver Jubilee was celebrated in 1961, by which time the Master saw the fulfillment of his mission in his own lifetime. Swami Sivananda radiated his divine and lofty message of service, meditation and God-realization to all parts of the world through his books, running to more than three hundred, through periodicals and letters. His devoted disciples are drawn from all religions, cults and creeds in the world. Swami Sivananda's Yoga, which he has significantly called the 'Yoga of Synthesis', effects a harmonious development of the 'hand', 'head' and 'heart' through the practice of Karma Yoga, Jnana Yoga and Bhakti Yoga. On the 14th of July 1963, the Great Soul Swami Sivananda entered Mahasamadhi (departure of a Self-realized saint from his mortal coil) in his Kutir on the bank of Ganga, in Shivanandanagar. Practical Way to Self-Realisation (904 KB) | Click here for the text of the discourse.